Origin and Habitat: Angola, Zimbabwe, Zambia, Malawi and Zaire. Habitat: Grows in deep sand and cracks among granite rocks. Specially protected in Zimbabwe. The species will disapper as a result of agricultural development and building (Lilongwe, Malawi). 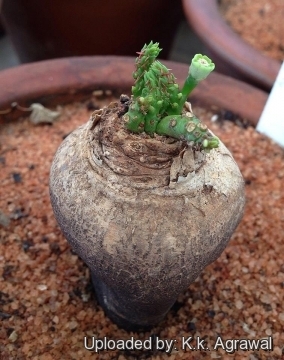 A seedling showing the characteristic leaf-bearing juvenile stage is possibly confused with a seedling of Haemanthus sp. 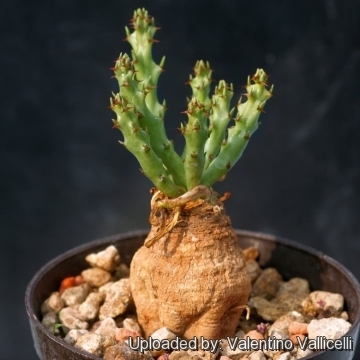 Description: It is a dwarf and very slow growing spiny perennial succulent with a large 'turnip-like' woody tuberous root. Spines: 3–4 mm long, widely divergent, with expanded bases. Flowers: Pale green with a red centre. 4) Wikipedia contributors. 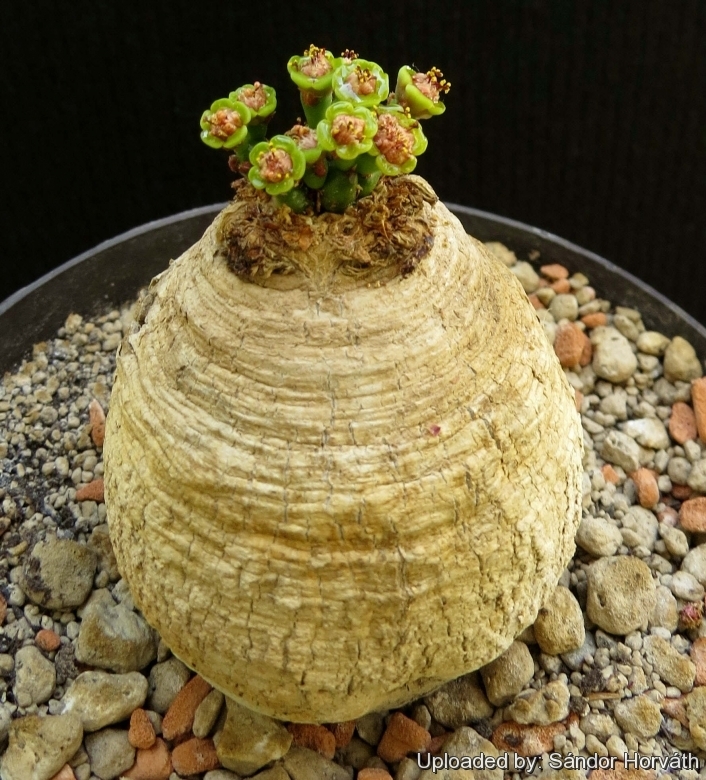 "Euphorbia decidua." Wikipedia, The Free Encyclopedia. Wikipedia, The Free Encyclopedia, 18 Feb. 2014. Web. 25 Oct. 2014. Growth rate: It is a slow growing species, but it it possible to increase the speed of growth to some extent by providing adequate amount of water, warmth, and fertilizer during the active growing season, but it’s susceptible to rotting if too wet and do not like a lot of water when they are on rest. 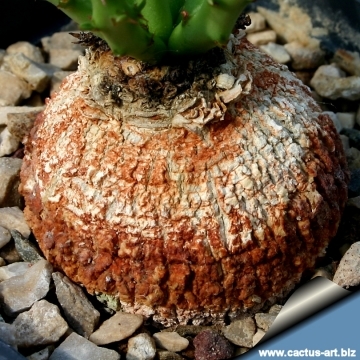 Soil and pots: It likes pots with generous drain holes, needs a very airy potting medium which mainly consists of non organic material such us clay, pumice, lava grit, and only a little peat or leaf-mould, seeing that the main trunk is planted with the majority of the roots below the caudex line. It's rare that it will use the upper third of its soil and often this area serves like a mulch or support for the stem. Exposure: This plant has an excellent heat tolerance, and need full sun to light shade exposures, it grows well even in full blasting sun, but can tolerate moderate shade, and a plant that has been growing in shade should be slowly hardened off before placing it in full sun as the plant will be severely scorched if moved too suddenly from shade into sun. The color of this plant is much more marked if grown in full sun. Watering: Water regularly during the active growing season. No water should ever be allowed to stand around the roots. Keep almost completely dry in winter. However this spurge will tolerate dryness and can even thrives in poor, dry soils, but do better when grown in nutrient-rich soils with regular watering. Hardiness: Some cold tolerance. This spurge has tolerated temperatures down to –6º C. However it can be difficult to get it to look its best without a good amount of heat and sun and so it is only really suited to the tropics (USDA Zones 9-12). It can be grown outdoors in frost-free climates. 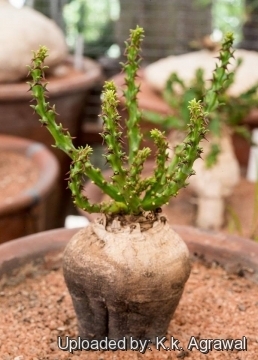 Rot: Rot is only a minor problem with Euphorbias if the plants are watered and “aired” correctly. If they are not, fungicides won't help all that much. Manteinance: Re-pot every two years and trim off the dead 'arms'. Propagation: The plant can be reproduced by seeds or cuttings. The seedling is best left until it is larger as it will grow faster if the root is buried. 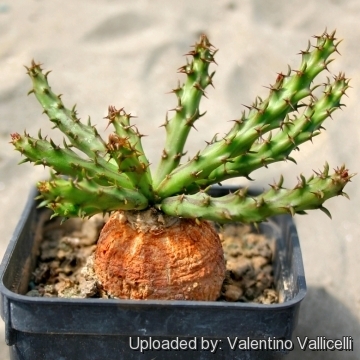 The plant may be propagated by branch cuttings which will grow and flower. Usually cuttings will not form caudexes unless double cut. Once growth is strong, the top of the green shoot needs to be cut off again to force the plant to start a caudex. 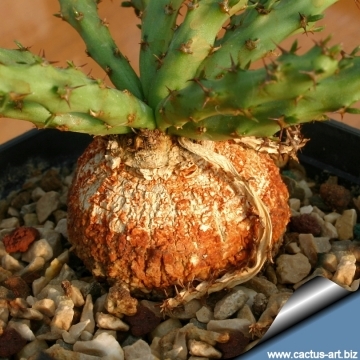 Some plant form a perfectly symmetrical caudex when grown from seed, but form distorted (but often more interesting) caudexes when grown from cuttings. If you remove an offset, remember to let it dry for some days, letting the wound heal (cuttings planted too soon easily rot before they can grow roots). 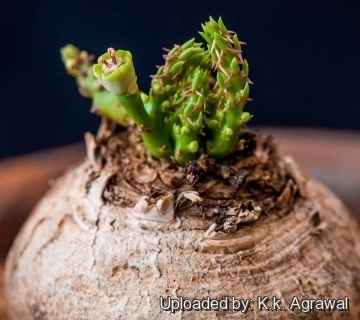 Lay it on the soil and insert the stem end partially into the substrate. 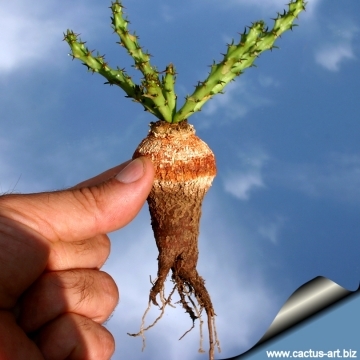 Try to keep the cutting somewhat upright so that the roots are able to grow downward. It is better to wash the cut to remove the latex.